Is That How You Say That? As you now, I’ve been listening to a monster-load of audiobooks lately (especially this month, since I’m having so much trouble with my hands). And for the most part, I really like them. But every so often a narrator pronounces a word in a way that makes me stop and question everything I know. So what do you thin? Have you ever been pulled out of an audiobook by a wonky pronunciation? Or have you learned you’ve been pronouncing a word wrong in your head for years? DNF (1) Realized it was a companion book to a series I haven’t read – basically like reading Quidditch Through the Ages if you’ve never read a single Harry Potter book. Yeah, it’s a lot, but it’s a combination of increasing my read-speed to 1.75x and not really being able to use my hands to do anything else. My body and I have never really been on good terms: I hated it for not being as tiny as the bodies of models and actresses, and it tortured me with things like endometriosis and chronic migraines. But this time it’s finally gone too far. About eight months ago my hands started falling asleep overnight (to the point I’d have to wake up and shake them until feeling returned). A couple of months ago I got diagnosed with carpal tunnel and given fancy braces to wear at night. At first it was great – my hands stopped falling asleep after the second night in the braces. But…then they started to hurt or cramp up when I did things, like type or draw or sew for long stretches of time. But I could handle that. I just had to make sure I didn’t spend too long at one activity. I made cakes and treats that didn’t require piped frosting, so I wouldn’t strain myself. My hands now ache almost constantly (unless I’ve taken migraine meds) and my thumbs have lost most of their strength – so far their random failures have caused me to drop plates of food and dump a scalding cup of tea down my chest. Even with braces on during the day, I can only type for short stretches of time, so I’ve taken a temporary break from my online crit group, and the goal of finishing this MG revision before school lets out feels like it’s evaporating in front of my eyes. Not to mention the fact that all my hobbies require prolonged use of my hands: sewing, decorating cakes, playing with modelling clay, drawing, and even photography. And of course my body isn’t content with just one method of torture – I’m still getting almost-daily migraines, I’m having horrible nightmares every morning, and I catch *every* bug the kids bring home. Basically I feel like I’m falling apart these days. Like my parents only went for the 39 year-warranty, and now that my birthday’s approaching, everything’s decided to break down. I’m going to start by saying that I fully believe cosplay is for everyone. I love seeing plus-size cosplays, pint-size cosplays, genderbent cosplays, hijabi cosplays, not to mention people of colour cosplaying traditionally white characters. But when it comes to my own costumes, I’m a super perfectionist. I want to be as screen accurate as possible, even if that means ruling out a whole slew of costumes because I don’t look enough like the character. Part of it is my own body image issues. It’s taken me a long time (looooong time), but I’m finally (mostly) comfortable with my body. However, I’m still not ready to cosplay She-Ra in her skimpy white skirt, despite her being one of my favourite characters growing up. And then there’s my shades. I need to wear them if I want to last more than 5 minutes without a migraine. (Even if sunglass-contacts were a thing, I have trouble with contacts). In past years I’ve just worn my shades, and taken them off for photos, but the problem is most people don’t seem to know who I’m dressed as while I’m wearing them – they completely ruin the effect of the costume. So, this year I decided to try something different. Instead of dressing as an exact replica of a character (because, let’s face it, there aren’t that many female characters with shades – except maybe for Trinity from the Matrix movies, which aren’t my favourite) I’d do a mash-up that incorporated my glasses. 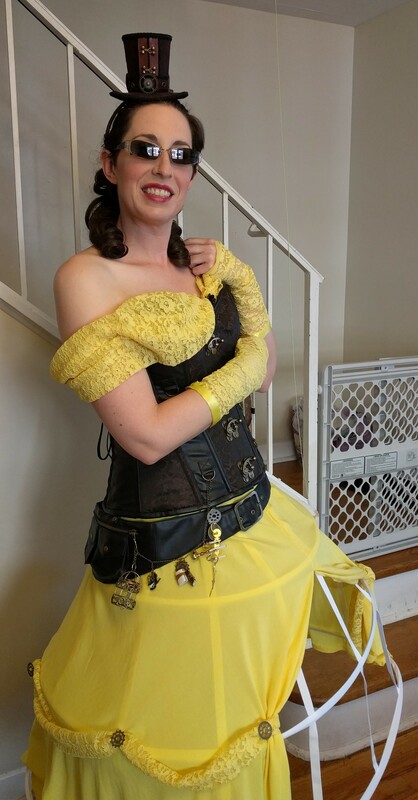 Which is how I ended up dressing as a Steampunk version of Belle from the animated Beauty and the Beast movie for Ottawa Comiccon last weekend. It was awesome. Not only did the costume turn out just how I’d imagined it, but it was recognizable, and I got stopped and asked for photos a lot. Now, if you’ll excuse me, I need to go and start planning my Steampunk She-Ra costume. *For those of you unfamiliar with the word, cosplay means dressing as a character from a movie, book or TV show, usually at an event like Comiccon or a movie release, etc. All right, after taking two weeks to wrap my head around the excellence of the 2018 SCBWI Canada East Conference, I’m ready to talk about it. As always, I’m not going to go into too much detail of the conference’s contents, because I feel that’s unfair to the speakers who earn money for delivering it, and the other attendees who paid money to receive it. Mostly I’ll just hit my highlights. I got to wear a glittery blue knit dress I’d scored for $6 (Canadian, even), and had a great time catching up with a critique partner and other writer-friends I mainly interact with online. Saturday morning I had a session hosted by writer Catherine Austen on Revision, which focussed as much on techniques for revising as it did on finding the motivation/confidence to actually do the revisions. It served as both a lesson and a pep talk – both of which I really needed. I also really enjoyed the session on Literary Branding by agent Maria Vicente of P.S. Literary (a Canadian-based agency that deals mostly with the U.S. Market). She told us to find a common theme in our works and to emphasize it as our literary brand. Can’t really argue with that one. But Aubrey’s critique was spot-on. Her criticisms mostly pointed out things that had been bothering me about the story (but which I really didn’t want to deal with and kind of hoped nobody would notice), and made me finally buckle down and deal with plot holes with an answer other than ***it’s MAGIC *** (insert *jazz hands* here). Anyway, after two weeks of pondering solutions, I’m finally about ready to jump in on what’s going to be a major revision – but one that will improve the story 100%. I can’t wait to get started. All-in-all I came out of the conference motivated, inspired, and with a bunch of new writer-relationships. Yay! I know I said I was going to write about the Canada East SCBWI Conference this week, but I’m still processing it, so instead I’m going to write about something I’ve noticed while reading listening to audiobooks (whatever). For the sake of keeping up in the industry, I’ve been doing my best to pick books published in the last two years, but every so often I forget to check publication dates and an older book slips in (especially if I run out of books on hold and have to find something available immediately). And (for contemporary novels, at least) it doesn’t take long for me to realize that the book wasn’t published recently. So you’d think I wouldn’t be quite so aware of the passage of time in books. Sometimes it’s the names that tip me off. Certain names, like Macy and Lacey definitely had their day, and it was a few years ago. Recent books are much more likely to involve cyber bullying, catfishing, and YouTube stars (or wannabe YouTube stars). Even texting, which has been around longer, has changed: book texting from a decade ago tends to involve a lot of short forms and l33t speak (I h8 u, OMG, lol, etc), while today’s texts reflect the usage of smart phones and auto complete, and let the characters text in complete sentences. They may seem like small things, but they add up to create an atmosphere. Not that the books themselves are bad, or shouldn’t be read – I’ve really enjoyed most of them. I just find it funny that the world might not always feel like it’s changing, until you stop and look back at how things used to be. Or…maybe I’m just getting old. DNF (1) – which I totally don’t feel guilty about this time, because it was racist and ableist.